Big agricultural companies say the next revolution on the farm will come from feeding data gathered by tractors and other machinery into computers that tell farmers how to increase their output of crops like corn and soybeans. Monsanto Co. MON +0.72% , DuPont Co. DD +0.62% and other companies are racing to roll out "prescriptive planting" technology to farmers across the U.S. who know from years of experience that tiny adjustments in planting depth or the distance between crop rows can make a big difference in revenue at harvest time. Some farmers are leery about the new technology. They worry their data might be sold to commodities traders, wind up in the hands of rival farmers or give more leverage to giant seed companies that are among the most enthusiastic sellers of data-driven planting advice. The companies vow not to misuse the information. "There's a lot of value to that information," says Brooks Hurst, 46 years old, who works 6,000 acres with his father and brothers near Tarkio, Mo. "I'm afraid, as farmers, we are not going to be the ones reaping the benefit." 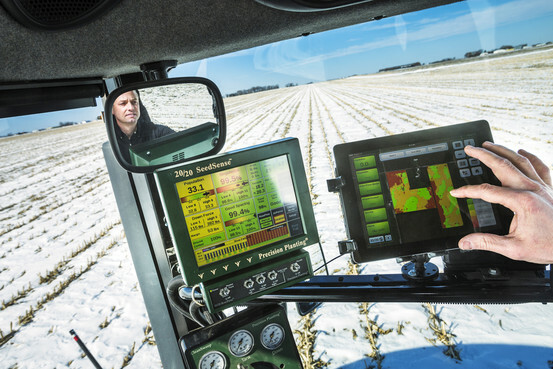 Many tractors and combines already are guided by Global Positioning System satellites that plant ever-straighter rows while farmers, freed from steering, monitor progress on iPads and other tablet computers now common in tractor cabs. The same machinery collects data on crops and soil. But many farmers have haphazardly managed the information, scattered in piles of paperwork in their offices or stored on thumb drives clattering in pickup-truck ashtrays. The data often were turned over by hand for piecemeal analysis. Sellers of prescriptive-planting technology want to accelerate, streamline and combine all those data with their highly detailed records on historic weather patterns, topography and crop performance. Algorithms and human experts crunch all the data and can zap advice directly to farmers and their machines. Supporters say the push could be as important as the development of mechanized tractors in the first half of the 20th century and the rise of genetically modified seeds in the 1990s. The world's biggest seed company, Monsanto, estimates that data-driven planting advice to farmers could increase world-wide crop production by about $20 billion a year, or about one-third the value of last year's U.S. corn crop. The technology could help improve the average corn harvest to more than 200 bushels an acre from the current 160 bushels, companies say. Such a gain would generate an extra $182 an acre in revenue for farmers, based on recent prices. Iowa corn farmers got about $759 an acre last year. So far, farmers who use prescriptive planting have seen yields climb by a more modest five to 10 bushels an acre, the companies say. The gains are likely to accelerate as companies gather information from more farmers. Monsanto has been testing a technology-powered planting service called FieldScripts with farmers since 2010 and is starting to pitch it this year in Illinois, Iowa, Minnesota and Indiana, four of the biggest corn-producing states. Farmers pay the company $10 an acre. No one knows how much is being spent to develop and market high-tech planting services, but 20% of Monsanto's projected growth in per-share earnings by 2018 could come from FieldScripts and other technology-fueled improvements, estimates Michael Cox, co-director of investment research at securities firm Piper Jaffray Cos.
"I see it as another potential transformation of the company," says Robert Fraley, chief technology officer for Monsanto, based in St. Louis. He helped develop Monsanto's first genetically modified seeds in the early 1980s. In November, Monsanto paid $930 million to acquire Climate Corp., a weather-data-mining company in San Francisco launched by former Google Inc. GOOG -0.91%executives. Agricultural cooperative Land O'Lakes Inc. bought satellite-imaging specialist Geosys in December for an undisclosed amount. DuPont announced earlier this month a collaboration with a weather-and-market analysis firm, DTN/The Progressive Farmer, to provide real-time climate and market information to DuPont's data-services users. Late last year, Deere DE +0.42% & Co. agreed to beam data from the Moline, Ill., company's green tractors, combines and other machinery to computer servers where DuPont and Dow Chemical Co. DOW -0.44% can formulate specialized seed-planting recommendations. "When a farmer buys a combine or buys a tractor, they've got all these ways to collect information," says DuPont marketing manager Joe Foresman. The Wilmington, Del., company's Pioneer unit has been sifting through farm-level data for about a decade, but now "this space is starting to mature." DuPont and Monsanto are excited about their data-driven services, partly because they can be rolled out to farmers much faster than new seeds, which often must endure a decade of development and regulatory review. Many farmers who have tried prescriptive planting are enthusiastic about the results. David Nelson, a farmer near Fort Dodge, Iowa, who began testing FieldScripts about three years ago, says it recognized nutrients in soil on a patch of land previously used as a cattle feedlot. The conclusion was based on fertilizer maps and soil samples gathered by Mr. Nelson, 39. Monsanto's system said the land could support denser rows of corn, and FieldScripts helped Mr. Nelson increase his corn harvest last year by 8 to 12 bushels an acre above the 10-year average of 190 bushels. The increase brought Mr. Nelson an additional $34 to $51 an acre. "We're pushing every acre to its maximum potential," Mr. Nelson adds. Other farmers are reluctant. The American Farm Bureau Federation, a trade group for farmers, has warned members that seed companies touting higher crop yields from prescriptive planting have a vested interest in persuading farmers to plant more. The trade group also says the services might steer farmers to buy certain seeds, sprays and equipment for their land. Jerry Demmer, a 61-year-old corn and soybean farmer near Albert Lea, Minn., is thinking about trying a data-analysis service but has "tossed and turned" over who will control the information. "It's our data," Mr. Demmer says, but "I'm not sure how we're going to protect that." 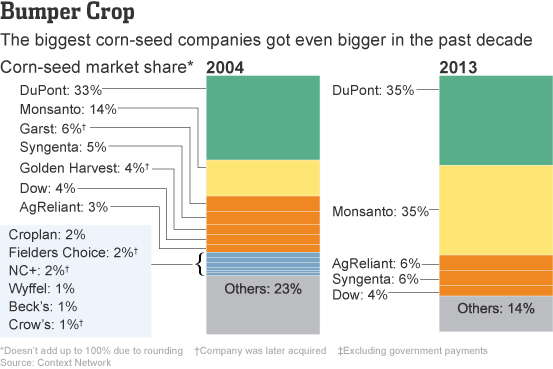 One reason that suspicions run deep among some farmers: a surge in seed prices as the biggest companies piled up more market share during the past 15 years, largely through takeovers. Monsanto and DuPont sell about 70% of all corn seed in the U.S. Last year, farmers paid about $118 an acre for corn seed, up 166% from the inflation-adjusted cost of $45 an acre in 2005, according to estimates from Purdue University. Companies say the higher prices reflect the benefits of using their genetically modified seeds, including bigger crops and resistance to insects and weed-killing sprays that have helped reduce the usage of harsh pesticides. Mr. Fraley, the technology chief at Monsanto, says it also decides annual seed prices based on seed supplies and commodities prices. Data gathered by FieldScripts aren't likely to be "a particularly big" factor in pricing decisions, he says. "We'll price our seed the way we've always priced our seed." Mr. Foresman of DuPont says the company doesn't use data it collects from farmers to help set seed prices. Battles with seed makers over who controls the seeds produced by genetically modified crops make some farmers even more wary about sharing information with the companies. In 2012, DuPont hired Agro Protection USA Inc., an intellectual-property-protection firm staffed largely by retired law-enforcement officers, to watch for signs of farmers who are saving second-generation seeds. Saving the seeds violates licensing agreements farmers sign when they buy seeds. Monsanto has filed lawsuits against nearly 150 U.S. farmers since 1997 for replanting seeds that contain the company's proprietary characteristics. Last year, the company won a U.S. Supreme Court victory in a case against an Indiana farmer who was 75 years old at the time. The most-worried farmers fear that somehow rivals could use the data to their own advantage. For example, if nearby farmers saw crop-yield information, it might spur unwanted competition to rent farmland, pushing land costs higher. Other farmers fret that Wall Street traders could use the data to make bets on futures contracts. If such bets push futures-contract prices lower early in the growing season, it might squeeze the profits farmers otherwise could lock in for their crops by selling futures. So far, there are no publicly known examples where a farmer's prescriptive-planting information was misused. Monsanto and DuPont officials say the companies have no plans to sell data gathered from farmers. Deere says it gets consent from customers before sharing any of their data. Kip Tom, 58, has been testing Monsanto's system on his 20,000-acre farm near Leesburg, Ind., for about three years and says he "would not plant 1 acre without it." He will start paying for the service this year. But he keeps a close eye on how data flow from and to his farm machinery. Last year, Mr. Tom unplugged a cable inside one of his combines, which he worried was capturing details of his planting algorithm as he harvested corn. Mr. Tom says the combine's manufacturer "didn't have any involvement in developing that intellectual property or that information, so we didn't believe they should have access to that." Some farmers have discussed aggregating data on their own so they could decide what information to sell and at what price. Other farmers are joining forces with smaller technology companies that are trying to keep agricultural giants from dominating the prescriptive-planting business. The owner of one small company, Steve Cubbage of Prime Meridian LLC, says his Nevada, Mo., company's independence from the seed, machinery and chemical industry "adds credibility," giving farmers an alternative with "their overall best interests in mind." About 100 farmers use Prime Meridian's precision-seeding service, and Mr. Cubbage expects the number to "increase dramatically over the next few years." The company is developing a system to store farm-by-farm information on a cloud-computing service that could give access to seed dealers, financial advisers and other outsiders approved by farmers. The Farm Bureau has held internal talks about whether the trade group should set up its own computer servers as a data storehouse, says Mace Thornton, a spokesman for the trade group. No decision has been reached. Big companies "can help me in the short term," says Brian Dunn, 43, who grows wheat, corn and sorghum on 2,500 acres near St. John, Kan. "But are they going to be my friend in the long term?" He uses Prime Meridian's service. 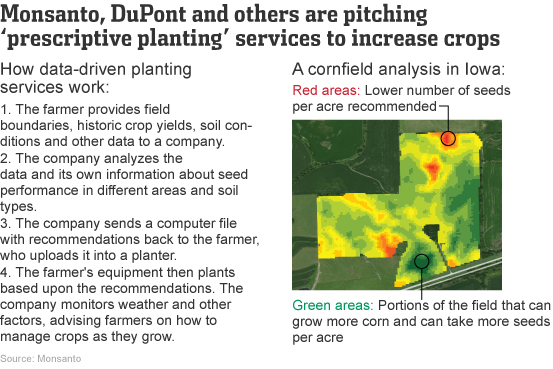 Mr. Hurst, the Missouri farmer concerned that seed companies will keep most of the benefits of prescriptive planting for themselves, is testing DuPont's technology on some of his land to see what happens. In a move to ease farmers' worries, Monsanto said last month that it supports industrywide standards for managing information collected from fields. The company aims to build a free online data storehouse where farmers could upload information ranging from crop yields to planting dates. Monsanto says it wouldn't access the data without permission from farmers. Mr. Fraley says Monsanto's farmer surveys show that the company is "enjoying the highest level of trust among our customers that we've ever seen." Some farmers "will be early adopters," he says, while "some of the folks aren't going to open up right yet." O fundador da Microsoft, Bill Gates, defendeu, esta quinta-feira, uma "revolução digital" para lutar contra a fome no mundo, apostando no reforço da produtividade dos agricultores com a utilização de sistemas de satélites, tecnologias audiovisuais ou de selecção de sementes. "Devemos reflectir muito seriamente sobre a maneira de tirar proveito de uma revolução digital para alcançar a inovação, incluindo na agricultura", afirmou o filantropo norte-americano em Roma, durante a reunião anual do Fundo Internacional para o Desenvolvimento Agrícola, agência especializada das Nações Unidas. "Se vamos cuidar dos mais pobres, devemos ocupar-nos com a agricultura. Acreditamos que os pequenos agricultores podem duplicar, e em alguns casos triplicar, a produção durante os próximos 20 anos, ao mesmo tempo que preservam as suas terras", disse Gates. Para tal, o fundador da Microsoft deu como exemplo a utilização de tecnologias informáticas ao nível das sementeiras, que poderão ajudar nas previsões de produção e reduzir o tempo de desenvolvimento de uma nova variedade. Bill Gates apoiou igualmente o intercâmbio de vídeos entre agricultores, para trocarem experiências, e a utilização de sistemas de satélite desenvolvidos por Ministérios da Defesa do mundo inteiro para conseguir uma maior quantidade de dados sobre terrenos agrícolas a nível global. O milionário norte-americano anunciou também em Roma que a sua fundação, a "The Bill & Melinda Gates Foundation" irá doar cerca de 200 milhões de dólares (cerca de 151 milhões de euros) para financiar a investigação sobre novos tipos de milho, mais resistentes à seca, vacinas para gado e projectos de formação para agricultores. "Os investimentos na agricultura representam a melhor arma contra a fome e a pobreza", sublinhou Gates, indicando que a sua fundação prevê investir um total de dois mil milhões de dólares (1,51 mil milhões de euros) a favor dos agricultores e da agricultura.